In order to ensure that our reflexology treatments are performed correctly, all of our therapists are California licensed massage therapists. Why our foot reflexology massage is different. Please arrive 5 minutes BEFORE your appointment time. Please be considerate to others. In order not to delay appointments for other clients, late arrivals will have their treatment time reduced by the number of minutes they are late. If you are LATE 10 minutes, then your treatment time will be reduced by 10 minutes, and so on. Our reflexology treatment works on calves and feet. Please wear loose fit pants so it can be rolled above your knees . Or bring in your shorts and change before treatment; please arrive early before your appointment to accomodate the extra time for changing clothes. Also wear sandals or flip flops so it's easy to take your sandals off. For the first 15 minutes our professional foot master will massage your head, neck, shoulders, and back while soaking your feet in a Chinese herbal bath designed to draw out toxins through the bottom of your feet. Read more about what's in your herbal soak. 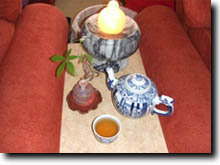 A Chinese herbal tea, made of several kinds of natural herbs, is served to you to drink while enjoying your foot masage. 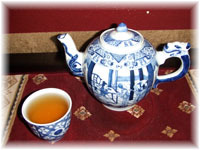 This gentle herbal tea helps in the process of eliminating toxins and improving circulation in your body. Then the next 45 minutes you will enjoy a relaxing foot massage with aromatherapy oils. Our licensed massage therapist will adapt the massage to your needs. See why our foot reflexology massages are different. Gift Certificates are available now, please call our San Diego location (858)715-1883 for details.